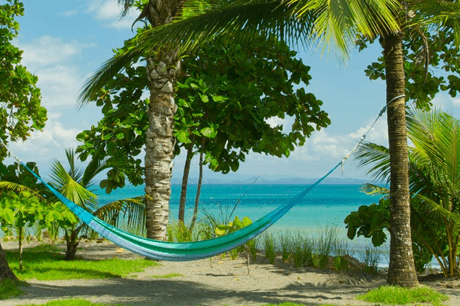 With 13 rooms and a capacity for 38 guests, this intimate beachfront eco-resort offers the ultimate sanctuary if you’re seeking solace from the hectic world. 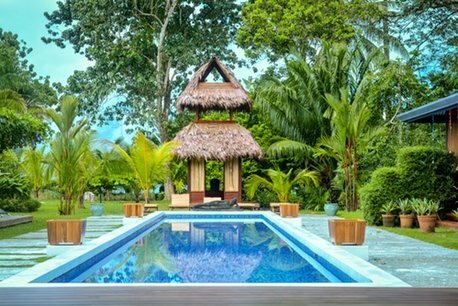 Nestled off-the-beaten-path in the virgin Costa Rican rainforest of the Southern Osa Peninsula, guests have an endless selection of quiet places to meditate and reflect. Eco-friendly not only in design, Blue Osa Beach Resort encourages guests to be mindful by implementing a morning silence to a pre-dinner ritual of presenting the food during their freshly prepared organic farm-to-table communal meals. For full relaxation, there is also a full-service spa offering Blue Osa signature facials and body scrubs. Massage practitioners offering therapies such as Thai and Deep Tissue Massage. A Chinese Medicine acupuncturist is also available. Built from the ground up as a sustainable micro-grid that runs mostly on solar power, Blue Osa intends to leave the smallest carbon footprint possible. By living in harmony with the environment, guests experience balanced, mindful living. To provide guests with an unforgettable experience that nourishes body, mind and spirit. 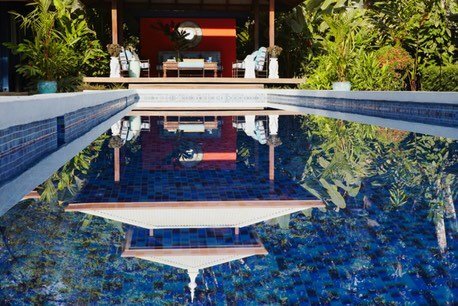 Step into the tranquil oasis that is Blue Osa. 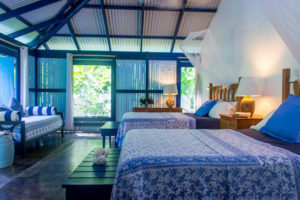 Set on a remote beachfront location, this eco-resort houses up to 38 guests in 13 comfortable eco-chic rooms located in three main buildings along with on-site facilities: A column-free 1,350 square foot open-air YOGA STUDIO on the second floor of the yoga building overlooks our private beach. A chemical-free LAP POOL with a solar-powered filtration system. An Eco-friendly copper-silver ionizing system is used so that algae and other bacteria cannot live in the water. At one end of our pool sits the POOL PAVILION with comfortable lounge sofas and chairs, perfect for a casual meeting or reading a great book. At the other end of the pool sits a beautiful Indian style TEMPLE with a fire kunda. This space is perfect for a private yoga practice or meditation. An ORGANIC GARDEN that provides our kitchen with fresh vegetables and herbs. On the property are mango, guanabana, starfruit, citrus, banana, coconut, avocado, and papaya trees and a pineapple patch. Additionally, we grow our own spinach, yucca, and other root vegetables. Everyday, our farmers bring freshly laid eggs to the cocina. In music, harmony often refers to a blending of tones that is pleasing to the ear. 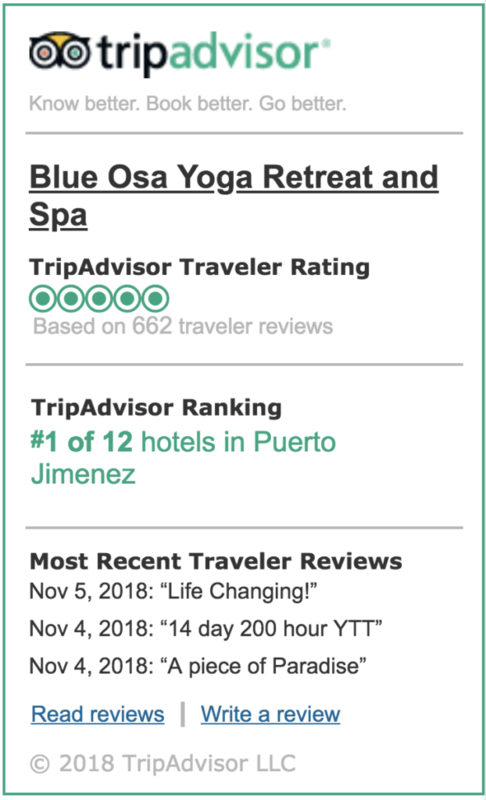 Here at Blue Osa, we believe in living with the rhythms of nature in a way that is pleasing to the soul. That means, rising with the sun, eating from the land, savoring the beauty of our natural surroundings and reducing our carbon footprint as much as possible (we are an off-the-grid eco-resort). Take care of the earth, and it will take care of you. This is the pure life. Have you ever physically been somewhere, but mentally “checked-out”? Perhaps, thinking about your to-do list, or your crowded inbox! We all do it, but this is exactly what keeps us from recognizing an important truth: True bliss exists in the present moment. Which is why we practice mindfulness and encourage our guests to do the same. Even the act of pouring your morning Costa Rican coffee can become a sacred, pleasurable ritual when done mindfully. This is yoga. We believe life is a never ending learning experience. Living stops when learning stops. We provide our guests with ample opportunities to discover, learn and grow. Everything from our adventure tours to our yoga classes, to our family style meals and spa treatments are carefully crafted with this in mind. Learn. Have fun. Discover new worlds, inside and outside of yourself. 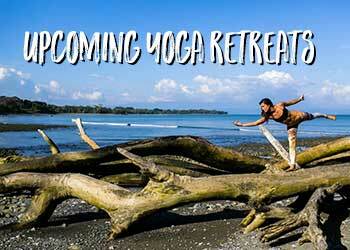 At Blue Osa, we practice what the ancients called karma yoga, or the yoga of selfless action. Whether we’re watering the grass, cooking a meal or answering a question –– everything is done with love. The result? A sense of being cared for that makes you go, “Ahhhh.” We think of everyone as being part of one great big family. From the friendly faces that greet you everyday to the community meals. Everyone knows your name and we go out of our way to ensure you enjoy your stay.